Photograph depicts four unidentified women. One may be named Rosenthal. 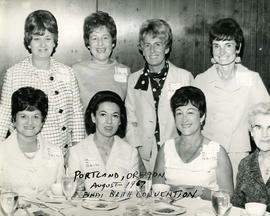 Photograph depicts Charlotte Pick of B'nai B'rith Women Golden Gate chapter. Photograph depicts Esther Nemetz in Seattle. 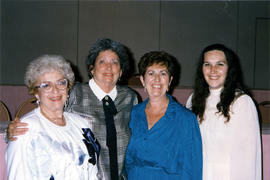 Photograph depicts Helen Smaub (District #4 Past President) of B'nai B'rith Women Berkeley chapter. Photograph depicts Esther Nemetz standing in front of the house she stayed in, in Los Angeles.Written on verso: "In front of the house where I stay, July 5th, 1932, Los Angeles, Calif., Esther." Photograph depicts Lilly Goldstein of B'nai B'rith Women Vista Diablo chapter. B&W print depicts Mrs. Ann Snider posing for the camera. "Los Angeles, Calif". is written along the bottom of the image.